A scorching drought in the southern Plains has caused hay prices to soar, benefiting farmers to the north but forcing many ranchers to make a difficult choice between paying high prices or selling their cattle. Ranchers in much of Texas, Oklahoma and even Kansas are having to pay inflated prices for hay and then shell out even more to have it trucked hundreds of miles from Iowa, Missouri, Nebraska or South Dakota. Their only other options are to reduce the size of their herds or move cattle to rented pastures in another state. "It's pretty ugly," said Don Davis, who raises grass-fed beef on his ranch about 75 miles northwest of San Antonio. Davis said he used to think last year's dry weather couldn't get worse, but this year's record-setting drought has put even more pressure on ranchers. Parts of Texas haven't received any rain since last fall, and forecasters predict the drought will linger at least through September. The situation isn't much better in western Oklahoma, southern New Mexico and parts of southern Kansas. Officials say only a handful of Texas' 254 counties received enough rain to grow hay this year, so significantly less is available at the same time demand has skyrocketed because pastures are parched. That's why the average price of hay climbed to $170 per ton this summer from $112 per ton last July, according to U.S. Department of Agriculture statistics. But many ranchers are paying much more because the price doesn't include shipping costs. 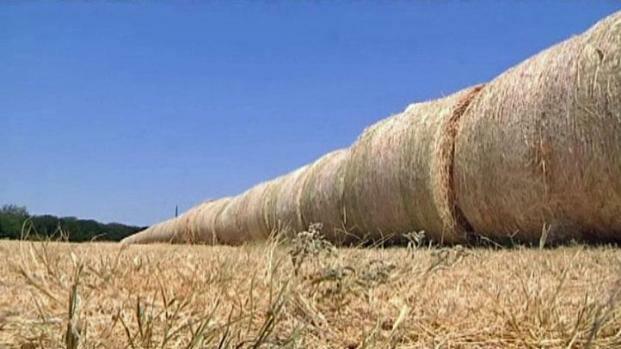 "Hay has gone up tremendously in price, and it's hard to get," said Jay O'Brien, who runs a ranch near Amarillo, Texas. Some farmers have turned to social networking to find hay. The Hay Connection, a Facebook site started by two Oklahoma brothers, matches buyers and sellers and had more than 7,500 fans by midday Sunday. Farmers in Iowa and Wisconsin banded together last week to donate several truckloads of hay to ranchers in Texas and Oklahoma, but those donations are likely to offer only a temporary reprieve. Nebraska hay farmer Cory Banzhaf said he's shipped about 80 percent of his crop -- roughly 2,000 tons -- south to Kansas and Oklahoma this year because of the drought. 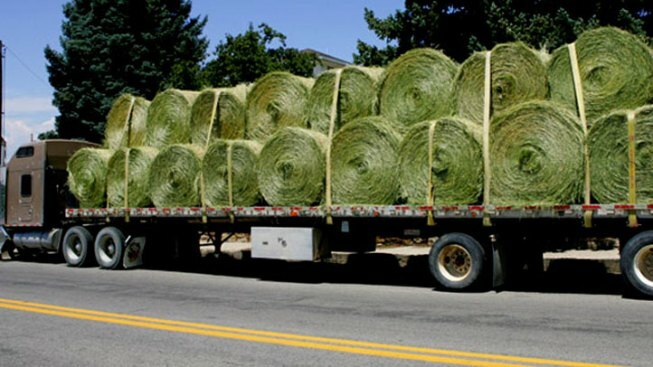 Banzhaf said trucking the hay grown near Pleasanton, Neb., adds $50 to $70 to the cost of each ton, leaving ranchers with bills of between $225 and $270 a ton. "It's great if you're selling it, but horrible if you're buying it," said Banzhaf, who can sympathize because he also raises about 1,000 cattle. Continuing to buy hay at those prices could be a recipe for bankruptcy, so ranchers have been selling off calves and cows of calf-bearing age even though they know it will be costly to rebuild their herds later. Davis said he had to truck in hay from Nebraska this year at a total cost of about $240 a ton to supplement the emergency supply he had in his barn. Normally, he relies almost entirely on pastures to feed his cattle. The cost led to his decision to sell off more of his cattle this year, even though he estimates his herd is about 40 head smaller today than it was in 2008. "I don't know that anyone could significantly plan for a drought like we've had," Davis said. Texas AgriLife Extension Service drought specialist Travis Miller said many livestock auctions in the state are so busy right now that they've been turning cattle away. Ranchers have been selling off cattle at double or triple the normal rate. "We've been culling and culling heavily," Miller said. Scott Dewald, executive vice president of the Oklahoma Cattlemen, said the southwest and northwest corners his state are in especially bad shape, forcing ranchers to bring in hay from as far away as South Dakota. Many ranchers also have lost access to water because ponds have dried up, adding to the need to reduce the size of herds or even sell all their cattle, he said. Fortunately, prices paid have largely remained strong because of high demand from foreign markets and other factors, enabling ranchers to make some money on the sales. "At least we didn't have the added insult of selling into a down market," Dewald said.